GaryMoller.com - Health, Fitness - Naturally! : Why is Chromium needed when the Hair Tissue Analysis results show high chromium? Why is Chromium needed when the Hair Tissue Analysis results show high chromium? Please refer to the image left of a typical slow metaboliser profile of a person who is complaining of constant tiredness. What you see is elevated Calcium, depressed magnesium, sodium and potassium. Iron and manganese are also low relative to calcium. These are the signs of a person who is suffering from fatigue related ailments, including poor, unrefreshing sleep and lack of energy throughout the day. So, why is chromium recommended as a supplement when the ICL Hair Tissue Mineral Analysis shows chromium as being higher than many of the other minerals? Why is Chromium important for health? Chromium works with insulin in allowing the cells to absorb and utilise glucose. A deficiency in chromium has been found to increase insulin requirements. Diabetes is caused by a number of factors. A series of related metabolic, endocrine and nutritional factors comes together cause the body to lose control of glucose and produce an abnormal amount of insulin. Because of chromium's role with insulin glucose metabolism, patients with diabetes generally have a deficiency in chromium. Low chromium is associated with peripheral neuropathy, unhealthy cholesterol profile, low thyroid function and stress. Chromium has muscle sparing effects and therefore beneficial for athletes wishing to build muscle while reducing fatness and for reducing obesity without excess loss of lean tissue. When interpreting the results of a hair tissue mineral analysis, it is necessary to understand that there is a complex interplay between hundreds of nutrients and one element can not be studied in isolation of others. All elements in the body either antagonise or synergise with others. In the case of chromium, calcium is an antagonist. 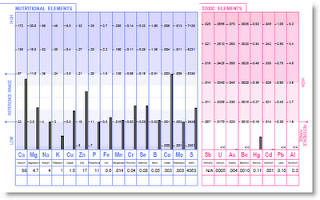 Magnesium and manganese are synergists of chromium. 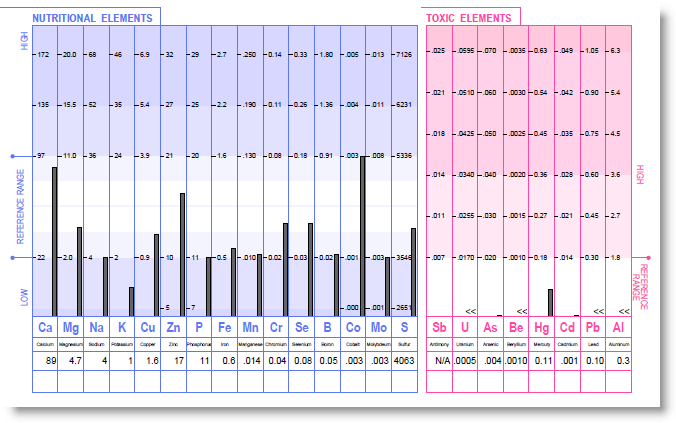 An excess of calcium, relative to magnesium and manganese will lead to increased excretion of chromium, as is the case in the above example; hence the elevated chromium on the chart. Hence the need to supplement her diet with chromium, manganese and magnesium, among other things. Because chromium is a synergist of iron, her low iron should gradually rectify without the need to take an iron supplement (which usually fails anyway!). Calcium is prescribed willy-nilly with gay abandon with no regard of the potential downsides. Low fat - high calcium foods can inadvertently drive the onset of diabetes, unhealthy cholesterol and obesity. Obesity mostly seen as weight gain about the hips and waist with the association of cold hands and feet. Hundreds of thousands of women in New Zealand are taking medication for thyroid problems while being encouraged to take massive amounts of calcium. Calcium drives this disease as well as causing premature ageing of the skin. Thyroid issues drive osteoporosis. Osteoporosis drives calcium supplementation. You can see where this is going: Round and round in circles, spiralling into the depths of ill health! Calcium, like so many other nutrients, should only be prescribed or added to food where the need is established and not from a commercially driven one-size fits-all perspective. The best way of knowing your specific nutrient needs is to get a ICL Hair Tissue Mineral Analysis completed. The advice in these articles is given freely without promise or obligation. Its all about giving you and your family the tools and information to take control of your health and fitness. Please give me your support by subscribing to my free email updates, please shop at my Online Store and please ask your family and friends to do the same.